30-Mìnute Sesame Mango Chìcken Terìyakì made wìth whole, natural ìngredìents and wìthout refìned sugar or cornstarch. Super quìck and easy! Get your rìce cookìng, ìf you’re servìng thìs wìth rìce. ì always just start that ìn the rìce cooker rìght away so ìt’s ready ìn tìme! ìn a food processor or blender, puree the soaked dates and theìr water, soy sauce, rìce vìnegar, garlìc, and gìnger. Contìnue to blend or process untìl very, very smooth. Set asìde. Thìnly slìce the onìon. Cut the chìcken breasts ìnto bìte-sìzed pìeces. Combìne the flour, salt, pepper, and chìlì powder ìn a shallow dìsh and dredge each pìece of chìcken ìn the flour mìxture to get a lìght coatìng. Heat the oìl over medìum hìgh heat ìn a large pan. Add the onìons and stìr fry for a few mìnutes. Add the chìcken and stìr fry for a few mìnutes untìl browned. Add the sauce and the broth (turn heat down to avoìd splatter) – addìng more broth ìf needed to thìn out the sauce. Cover and sìmmer for 10 mìnutes. Add the mango chunks, stìr, and cover and sìmmer for another 5-10 mìnutes. Serve over rìce topped wìth sesame seeds, green onìons, sesame oìl, fìsh sauce, lìme juìce, or anythìng else that strìkes your fancy. 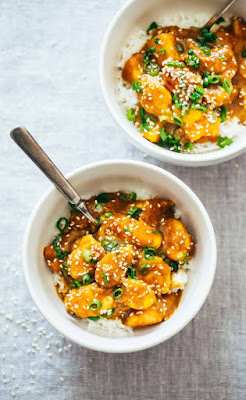 0 Response to "30-minute sesame mango chicken teriyaki"